An evening hosted by Laurence, Oli, Dean and Matthew! 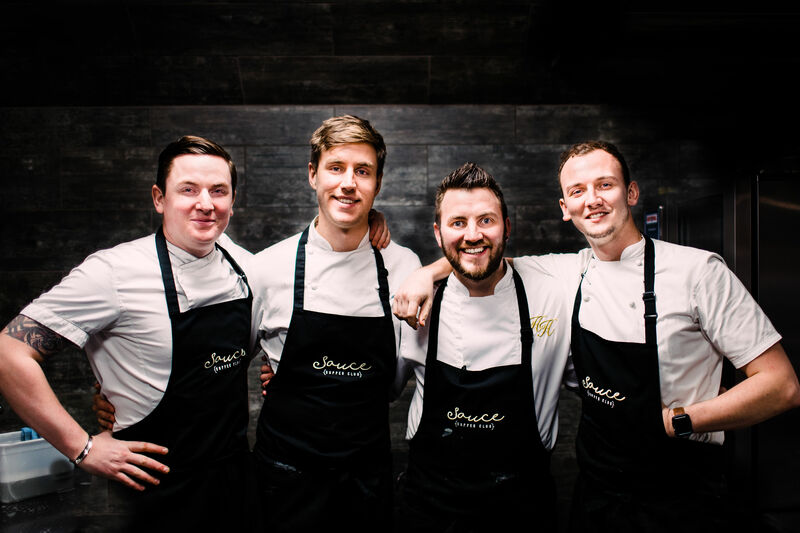 We are delighted to welcome MasterChef: The Professionals 2018 winner Laurence Henry along with fellow finalists Dean Banks, Oli Martin and Matthew Ryle to the stunning House Restaurant within the iconic setting of The National Theatre, Southbank in April for a fantastic Sauce Supper Club event. Following the intense competition the four are now firm friends and looking forward to being back in the kitchen to showcase what they do best – producing incredible dishes! We are excited to host the fantastic four at our April event in House Restaurant – a stylish dining destination within the National Theatre, serving a contemporary take on classic restaurant dishes. Due to the nature of this event we cannot cater for any dietary requirements. This event has been independently organised and is not associated with or endorsed by MasterChef: The Professionals, Shine TV or the BBC. Please note parties of 2 may be sat with other Supper Club members to maximise the tables. Some Supper Club Members do not like to see the menu before the evening, however if you would prefer to see it please email beth@saucesupperclub.co.uk for a copy! This is an historic event. Please fill in the short form below to be added to our mailing list, where you will get the latest information on our upcoming events.